Italics indicates more data to come. City leadership has not asked for a new arena. We met earlier this year and we discussed priorities. Those priorities included moving from an annual budget to to multi-year capital, staffing, and operating budgets. We also prioritized affordable housing and infrastructure maintenance where we currently show an enormous unfunded liability. We really haven’t made much progress on any of these. No one even suggested that a new capital facility was a priority. We don’t know how the new Mayo Civic Center is going to perform, but dismal convention and conference bookings for 2019 and on seem to indicate some real reasons for alarm. Almost all convention centers are subsidized as is Mayo Civic Center, but usage for community events is something that I would expect in return and that is still being hashed out. Some of us are currently investigating just how bad thing are. No city departments are asking for a new arena. Some community engagement pertaining to the new comprehensive plan and overwhelmingly putting substantial of public dollars into a stadium / arena was not supported. Further we just did a parks master plan where a new arena didn’t even crack the long term list of priorities. The idea of an arena was presented to the council 2 years ago and it fell flat on its face. Despite this a tremendous amount of publicly funded time has been devoted to the pursuit. Yet the presentation to the council was lacking in the detailed information that is likely available. Some of which is contained in this post. This is being presented as time sensitive, but no data explaining the urgency has been shared. Major capital projects in the city of Rochester should go through a public process that establishes priority. Individual advocacy groups should not preempt council action. The business case shows public investment, but then quantifies the return, largely to the private sector. A real net impact to city finances is needed. I have begun to look at this, but the arena would likely be a money loser for taxpayers, add to annual tax levy, and if a private entity were taking profit of the top would be even worse. Regardless of venue Rochester is unlikely to be able to compete with casinos, college venues, and the Twin Cities for many, if not most events. Often exclusivity clauses will prevent an event in Rochester if it is held in one of these other locations. $60 million is a huge sum of money. There has been little public discussion as to where this would come from so I did some digging and found this. I did ask the RCVB and this was discussed at one point and there is no update. That data is shown above. There are a number of concerns here. We can’t pay for current essentials so I don’t believe we will free up $32 million for an arena. Can we tear down Taylor arena and build another for $60 million? I doubt it. I don’t believe the public will support a tax increase or new tax for an arena. I am skeptical that we will get $10 million for naming rights / sponsorship. I don’t believe that DMC will accept this as a priority. “Other” is vague but I am assuming it is a public contribution and part of the $32 million..
What are these ancillary development and area rights? There are only 2 public parcels in the area. One is Mayo Park, the other is the library. RCVB did say Mayo Park is off limits. They have not had discussions with the Library. I say the Library is off limits, and suspect that is not the intent. This leaves 2 possibilities, building on top of an arena, which is intriguing, but probably not feasible or the development of the Wells Fargo property to the North. We would welcome a development to the North irrespective of an arena. Riverfront in downtown Rochester will sell itself. Not sure what would cause a developer to throw in a $18 million contribution, but if this is using TIF as a funding source, that is NOT private equity. There is no such thing as a free lunch so what must the city give up to secure the $18 million in private funding? I am going to add a hypothetical community benefits comparison, but will do that later. In short $32 million buys tremendous park amenities. I do not want to lose sight of the fact that is grossly inappropriate for an employee of the Convention & Visitor Bureau (or fully funded subsidiary) to be participating in a discussion brought forward by the Convention & Visitor Bureau. I hope the media doesn’t suffer a severe neck strain looking the other way. Taylor Arena is not loved by anyone. The facility is functionally obsolete and frankly has been since a poor design was selected. One of my favorite parts of the latest expansion is that it hides the awful appearance of Taylor Arena (from the East, anyway). The venue functions for some events, but those events are unlikely to grow. As an amenity, I suspect I would be a frequent user. I enjoy USHL hockey and would probably have season passes. Not sure if we actually would ever see an NBA development league team, but some would enjoy that. While I am skeptical that we would get many more shows, we would have better facilities for them. Assuming the project did not encroach into Mayo Park, it could be an amenity for Mayo park and help with passive safety measures. I don’t think a task force should be put in place without understanding how dire the 2018 budget is. It will be bad. After that we should explore the relative interest in devoting time to this, versus other priorities. That said because I am a skeptic, would ask questions and demand quantifiable data, I would serve on such a committee; if my peers insisted on its creation. My fear is that the task force would be a bunch of fans, the presence of skeptics such as my self would lend it some more credibility. Also any potential task force would need to be subject public data and meeting requirements. I don’t believe we should create a task force until after a broader discussion on priorities is had. I believe affordable housing, broadband access, transit, and the Library are all more deserving of task forces. Any committee should also consider competing projects as well. To give this one suggestion exclusive access and priority would be a huge procedural disservice. That said we don’t have any money and if we did it should first go to needs like parks, infrastructure, housing, and transit. What is the annual cost, yes interest is cheap,but the bond needs to be redeemed, what would the attendance need to be to break even? Is it just another drain on the annual budget of the city? Would the funders accept it as a enterprise zone, payments only from income? I would rather see money (pubic and private) used to do something with the Chateau before it crumbles or is too expensive to remodel. Two complete strangers struck up a conversation with me in a downtown restaurant a few months ago. One comment they had was that the lodging tax was outrageous. I didn’t know much about that, but apparently, it actually causes some people to consider not coming to Rochester for events. So I am concerned that one the one hand, we need a lot of visitors to make the Civic Center investment pay off, but the other hand is pilfering the funds from these same visitors with an already high tax. I would not recommend increasing that tax since it might backfire. The imaginary DMC funding proposed — is that actual hard cash or just the credit for the city’s actually paying it out? The DMC refuses to even address issues like regional transit or the building of the proposed “hubs” (being out of the 4 square blocks owned by the Mayo Clinic) as a legitimate and essential part of achieving the goals of the DMC, that is, to enable the workers to live here, park here, transit here, or to put some economic development in areas that are not in the immediate downtown area. It is 2017; video conference people! I will have to review my recording of the presentation, but I do not think the numbers of proposed users of the arena was realistic. To make it seat 6,500 or even 3,000+ and then to calculate the actual parking spaces available to handle that crowd, did not add up to me. Given that the City Council has worked so hard to deny residents and employees of Mayo to park downtown, the thought of providing several thousand parking spaces for people to attend a handful of sports events makes me sick. There is virtually NO ACCESSIBLE PARKING for the Civic Center and the revised venture illegally eliminated the handicapped parking for the Rochester Art Center. It is about 1/2 mile from the ramp to the door of the Art Center. How far is it to the arena? Would there be a convention and a hockey game at the same time? Has anyone done the math? Where do the library and art center users park at those times? I heard a rumor that someone might be inventorying or otherwise reviewing bus stops and the shelters for DMC. Presumably only by Mayo and the route to St. Mary’s given their limited interest in the rest of Rochester. But have any of the arena fans ever looked at the shelters in town? Most are beyond appalling. None are heated. Most are not accessible. Most are badly designed and placed. And DMC is not going to pay for any replacements much less any new ones along any of the pathetically inadequate bus routes we are stuck with. But sure, some developers would make a killing on a $60 million dollar boondoggle that a hockey arena represents while SO MUCH MORE needs to be done for basic needs of the majority of Rochester residents. 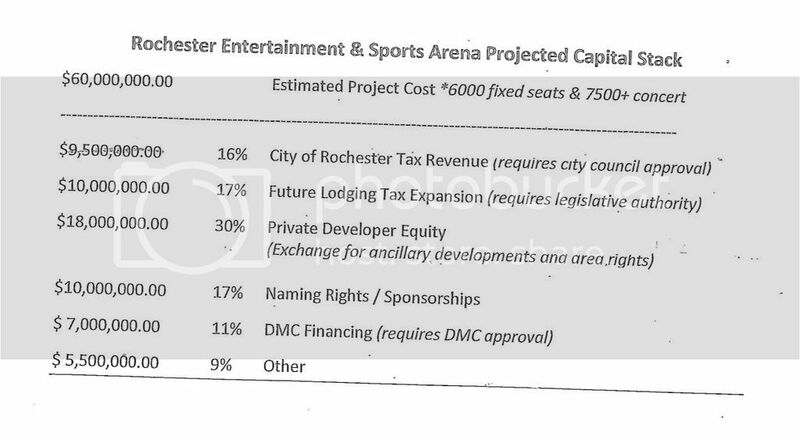 Before there is an arena task force, there better be a DISABILITY RIGHTS task force for Med City because Rochester gets an F for failure in my assessment.